While watching a television show titled Forensic Files last night I heard the narrator said the victim might have been a part of a love triangle. I immediately connected with the idea of being a part of a love triangle myself. Hold it! Before you get the idea I’ve lost all of my marbles. Let me explain what I mean. 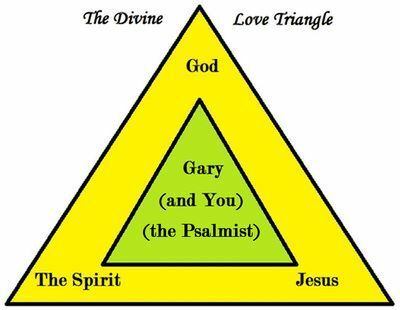 First, it is a Divine Love Triangle with God at the top, Jesus at the bottom right corner, and the Spirit at the bottom left corner. Believe in presence of the GOD and in the strength of his GRACE! Note: Should you want to go back and review this Glory Seed or if you would like to subscribe so you can receive them in your email you can do so by clicking on this link: https://gloryseeds.wordpress.com/.